I was able to make a trip back home. Like this baby koala hugging the tree there's a huge list of food that I would hug if not for the fact it would be better off in my belly... So I made a list and hit everything I could. I did miss a few pictures, like Pho at Pho saigon, Ramen at Michi and my very first meal off the plane BBQ at the salt lick. Breakfast tacos from Taco deli with Dona sauce.... with BACON. The bacon in Australia is made from pork back which includes that circular bit that we call Canadian bacon. Anyhow, tortillas are hard to come by and I thought about bringing back a tortilla press but I didn't find a source for masa. The only place I found breakfast tacos in Sydney cost like $8.50 (in AUD but still it's outrageous). Caldo de Res and Barbecoa taco at Vasquez. A favorite spot for my old team. This is what I get when I "want it all" and can't decide on barbecoa plate or the Caldo. You can't go to Texas without having chicken fried steak... for breakfast.... that and biscuits and gravy and of course BACON (I had a lot of bacon here). It wasn't the best, but I had to hit the Jim's it's home to many a hangover meal and quick breakfast. I've got some curing salt and liquid smoke (I don't have a smoker in Sydney) in my bags so I plan on making my own American bacon. 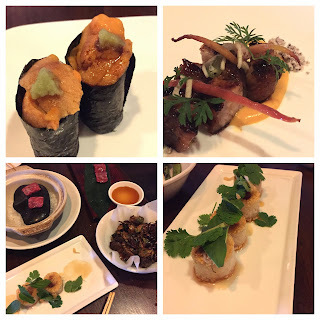 Of course I had to hit my favorite sushi shops, we went to Soto (my north austin favorite) and my wife took me to Uchiko for my birthday dinner. But nothing beats my ultimate favorite: Mom's home cooked food. To celebrate my birthday (which I will actually skip this year as I fly over the international date line) she whipped up this great meal of all my favorites: Peking duck (using lettuce leaves to save on carbs), Hsin Chu Mi Fun 新竹米粉 (Rice noodle dish from my mom's home town), Sauteed Chinese water spinach, soy pickled cucumber, thousand year old egg with Cha Shao and beef tendon and miso baked salmon. Thanks Mom! I can't wait to come back home again there's so much I missed. At least I have these pictures to keep me warm as we enter winter down under.